Edward Bushyhead was at various times Sheriff, Chief of Police, and one of the founders of the San Diego Union. The courage of Ralph Conklin was legendary along the border, and there were many others. Perhaps the best known, and at the same time the least known of these men was Jefferson "Keno" Wilson, who spent long years as a city, county and federal officer. More would be known of him were it not for the fact that his modesty amounted almost to bashfulness and it was hard to get him to talk about his past exploits. Jefferson Keno Wilson, one of a family of twelve, was born a century ago, the date being October 26, 1862. He was born in Visalia California and lived there until he was eight years old, when his family moved to Denton County, Texas. Visalia was then a particularly tough frontier town, and was so strong in its leanings toward the Confederacy that during the Civil War the observance of Fourth of July is said to have been suspended, because of the resulting riots. Several years later he returned to California and got a job as an investigator for an Anaheim land-development company. Meanwhile his favorite brother, Charlie, became City Marshal at Oceanside and Keno, now just 21, was appointed as his deputy. Then occurred a tragedy which he seldom mentioned in his later years, but which haunted him throughout his life. It started with his arrest in 1888 of a roistering Texan named John Murray, who he picked up on his brother's orders. Murray swore that some day he would "get the drop" on Charlie Wilson. Some time around 1 o'clock on the morning of July 4, 1889, the Wilson brothers heard shots, and the breaking of glass near the old St. Cloud Hotel, where a small crowd, afoot and mounted, had gathered. As they approached they saw that Murray, on horseback, was holding in his hand a kerosene lamp taken from one of the streetlights. The Marshal grabbed Murray's horse by the bridle and Murray, after throwing the lamp at his head, drew his gun and shot him through the heart. He was dead when he slumped to the ground. Keno fired three shots at the fleeing Murray, but missed, and it was several hours before he was captured near the Mission San Luis Rey. Knowing that a lynch mob had formed in Oceanside, heavily-armed men spirited him in to San Diego in a spring wagon. Found guilty of first-degree murder he was sentenced to death, but the verdict was appealed to the State Supreme Court and the case dragged on. Finally the Supreme Court, declaring that local newspapers had unduly inflamed public opinion against him, set the verdict aside and a new trial was ordered. Eventually he was again convicted but the sentence never was carried out, for on April 14, 1892, he died in the County jail, a few weeks before he would have been hanged. 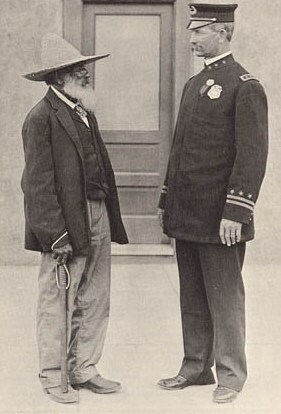 After his brother's death, young Keno became the City Marshal at Oceanside and remained there until he was appointed a Deputy Sheriff in 1893, he remained with the Sheriff's Office until 1895, when he became a line-rider in the U. S. Customs Service, stationed at Camp and having jurisdiction from Dulzura to Yuma. A visitor to Campo during that period says: "The night we stayed at the hotel at Campo, Keno Wilson was sitting out on the porch with a Winchester across his knees." It is easy to assume that with the rifle-toting Customs man on hand, there was no trouble in Campo that night. During his tour of duty at Campo, Keno Wilson was the proud possessor of a badge which was, to say the least, unique. The badge, recently presented to the Serra Museum by his grand-daughter, Mrs. Martha Mahoney of San Francisco, is fashioned from a Mexican silver peso. In 1899 Keno Wilson left the Customs Service and on Dec. 18 of that year he was appointed to the San Diego Police Department as a patrolman, and so started on a career of public service which was to last more than a quarter of a century. Tall and gaunt -- he was six-feet-three -- he was an impressive figure when on foot, and even more so when he was promoted to Mounted Patrolman a few years after joining the force. Although he would tolerate no nonsense the thin, taciturn man with the drooping moustache had scores of loyal friends. His sense of fair play was the same in arresting a thug, breaking up a waterfront crap-game or dealing with the small-fry whose signal for dispersal was a cry of "Jigger! Here comes old Keno Wilson!" Typical of the respect which was felt for him was the case of how he acquired one of his most prized possessions, a beautiful, pearl-handled Colt's .45 revolver which had belonged to the Chief of the Indian tribe at Pala. When the old Chief died his sons came in to San Diego and carried out their father's last wish by presenting the gun to this San Diego policeman. On May 3, 1909 he was appointed Chief of Police by John L. Sehon, Commissioner of Police, Health and Morals. Two years later he was handed the difficult task of closing "Stingaree", which was San Diego's version of the Barbary Coast of San Francisco. It is noteworthy that in spite of pressure from the powerful reform element, he refused to act until some provision was made for the prospective "unemployed young ladies" of the area, either in the form of legal employment or at least transportation to some other city. In 1912 he piloted the department through perhaps the roughest period in its history, when the city was over-run by members of the Industrial Workers of the World. Nucleus of the I.W.W. was a group of recent soldiers-of-fortune who were ousted from Mexico following the 1911 revolution, and they were much given to soapbox oratory of the "Down with the capitalists!" type. When their harrangues swung to the use of more and more of the four-letter words they were banned from the six-block area bounded by Third, Sixth, C and E Streets. Immediately the issue of the suppression of free speech was raised, other members of the I.W.W. poured into town from elsewhere and arrests were so many that conventional law-enforcement bogged down. A "Vigilance Committee" of citizens swung into action and the ensuing scene was not without violence before order was restored. Laboratory techniques, two-way radio, statewide teletype networks and technical training through the facilities of the FBI are taken as a matter of course in today's unending battle against crime. It is a far cry from the era when the most effective peace-officer was the one with the highest rating in personal courage, the ability to draw and fire with speed and accuracy, and the sixth-sense cunning of an Indian scout. The fact that these bygone western lawmen were as effective as they were, probably was due to a mixture of their own iron personalities and the fact that the criminal of the handle-bar moustache period did not have the advantage of the automobile and of a doctrine of softness toward even the long-time offender. When the gun-slinging Town Marshall met his adversary he either shot it out with him, or lugged him off to a bearded judge who was neither interested nor impressed by the fact that he might have come from a broken home. San Diego County has not been lacking in colorful peace-officers, starting with the controversial Agoston Haraszthy, who moved north to become the founder of California's wine industry. There was that stalwart Town Marshal Adolph Gassen, who was known to walk up and take rifles away from men who pointed them at him. Keno Wilson was a good policeman but a poor politician, and under the set-up then existing, that was fatal. Following a change of administration, he was out of a job on January 17, 1917. The new Chief made him an Acting Sergeant, but that lasted only until early the following month, and three months later the Chief himself was out. Keno was reinstated as a patrolman by Chief S.P. McMullen on December 17, 1917, and thirteen months later another new Chief, James Patrick, promoted him to Sergeant. Patrick had been appointed to the force as a Patrolman by Chief Wilson. On May 17, 1926, Keno Wilson retired, his last years on the Police Department having been as Desk Sergeant. As this one-man counterpart of today's modern Business Office, his communications system consisted of one lone telephone, and a push-button which rang a bell in the alley beside the old Second Street jail, to signify that the ambulance or the patrol-wagon was needed. He also dispatched the motorcycle "Emergency Rider" who answered all hurry calls from Mission Hills to the National City line and east to Normal Heights and the cemeteries. After retiring, he became Deputy U.S. 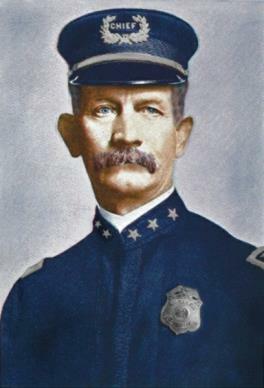 Marshal for the San Diego area, and served until late in 1933. He died in his home at 2103 Island Avenue on September 24, 1934. It would not be amiss to say that western movies and pulp-magazine thrillers were what robbed us of getting the true Keno Wilson Story. In his later years, relatives urged him to jot down his memoirs, but so thorough was his disgust with the Horse Opera school of literature that he declined, and when he headed for the last roundup much of San Diego County's untold history went with him.